So what are you waiting for? Get out there and find some birds! 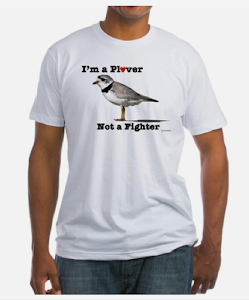 There are primarily two birding skills that are used by most experienced birders to find and identify birds. They are visual birding ("eye birding") and auditory birding ("ear birding"). Over the past decade, however, I have found that one technological advancement has trickled down to the discipline of birdwatching and led to a third skill - "phone birding". I first became aware of the art of phone birding on April 24, 2006. It was late afternoon and I had retired to my roof to relax before dinner and look for migrating birds that were heading north. My friend Sean, who lived 3/4 mile to the southwest, was on his roof doing the same. We chatted on the phone as we scanned our respective sections of sky. At one point Sean excitedly announced, "There’s a Northern Harrier flying over 5th Avenue!" The avenues in this part of Brooklyn run, loosely, from north to south. I waited a beat, trained my bins in his general direction, then replied, "It just passed over Methodist Hospital". Fast forward to April 22, 2014, one week ago. I had work to do during the early morning and couldn't get out into the park for some spring birding. It was about 11am when I finally ventured into Prospect Park. Sean called me as I was walking through the park's "Ravine", passed the back of the "Upper Pool". He gave me the rundown of his morning's birding while he walked to the subway station near his house. About 5 minutes into the conversation he stopped in mid-sentence and exclaimed, "There are two Bald Eagles flying over me!" I asked him in what direction they were flying, to which he replied that it looked like they were heading towards Prospect Lake. 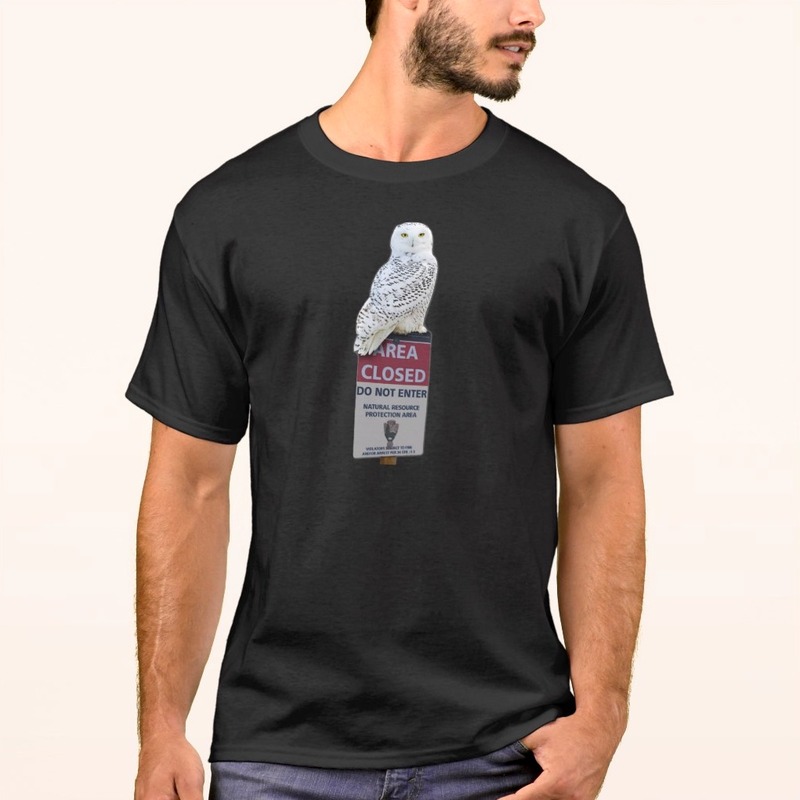 He continued his binocularless description of the huge, soaring raptors as I ran down the steep path towards the open sky of the Nethermead Meadow. Once in the middle of the field I spotted an immature Bald Eagle in the sky to my south, over the neighborhood of Windsor Terrace. It soared into the park between Lookout Hill and the Quaker Cemetery, then followed the park's ridged, forested spine, quickly moving north and out of sight. WASHINGTON, DC, April 23, 2014 (ENS) – The warming climate is melting sea ice, opening U.S. Arctic waters to shipping and oil and gas development, but the National Research Council warned today that U.S. personnel, equipment, transportation, communication, navigation, and safety resources are not adequate for an Arctic oil spill response. In a new report released today, “Responding to Oil Spills in the US Arctic Marine Environment” the National Research Council calls this absence of infrastructure a “significant liability” in the event of a large oil spill. The Arctic poses challenges to oil spill response, such as extreme weather and environmental settings, limited operations and communications infrastructure, a vast geographic area, and vulnerable species, ecosystems, and cultures. “There is a need to validate current and emerging oil spill response technologies under these real-world conditions,” the report finds. The committee recommends that “carefully controlled field experiments that release oil in the U.S. Arctic be conducted as part of a long-term, collaborative Arctic oil spill research and development program that spans local, state, and federal levels. It suggests that positioning response equipment such as aerial in situ burn and dispersant capabilities in the region before a spill occurs would provide immediate access to rapid response options. The U.S. Coast Guard’s presence and performance capacity in the Arctic should be enhanced, the report recommends. The Coast Guard should work with the Alaska Department of Environmental Conservation to develop an oil spill training program for local communities and trained response teams in local villages. They also should integrate local and traditional knowledge of ice and ocean conditions and marine life to enhance oil spill response, the report says. 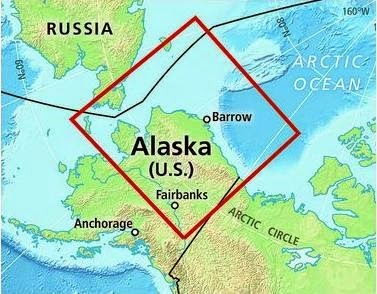 Given the nearness of U.S. Arctic waters to international territories, communications between command centers, coordinated planning, trans-boundary movement of people and equipment, and identification of translators, should be addressed before an actual spill, the report says. While formal contingency planning and exercises with Canada have been established, the U.S. Coast Guard should expand its bilateral agreement with Russia to include Arctic spill scenarios and conduct regularly scheduled exercises to establish joint response plans, the report recommends. “High-quality nautical charting is essential for marine traffic purposes and oil spill response in the Arctic. However, shoreline topographic and hydrographic data are mostly obsolete, with limited tide, current, and water level data and very little ability to get accurate positioning and elevation,” the report warns. “Private AIS [Automatic Identification System] receivers are used to track vessels in the Bering Strait and along a large part of Alaska coastal areas, but there are significant gaps in coverage. Consequently, there are numerous regional ‘blind spots’ where an early indication of elevated risks may not be apparent to officials on shore,” warns the committee. The committee also cautions that the Oil Spill Liability Trust Fund “may prove insufficient to cover the sociological as well as economic damages of an affected community,” adding that a structure other than the National Contingency Plan may be needed to deal with broader social impacts resulting from a significant oil spill. The study was sponsored by the U.S. Arctic Research Commission, the American Petroleum Institute, U.S. Coast Guard, U.S. Department of the Interior, Bureau of Ocean Energy Management, Bureau of Safety and Environmental Enforcement, Marine Mammal Commission, National Oceanic and Atmospheric Administration, Oil Spill Recovery Institute, and the National Academy of Sciences. “The inevitability of an oil spill given the industry’s drive for profit at all costs, the immense difficulties of responding to an Arctic spill and the devastating impact a spill will have on the region’s residents, wildlife and ecosystem should be enough to prevent this lunacy,” said Deans. In 2012, Royal Dutch Shell started drilling the first wells in the Alaskan Arctic in nearly two decades in the Beaufort and Chukchi Seas. Shell’s goal for the summer drilling season was to confirm a major discovery of oil in commercially-viable quantities in the Alaskan Arctic Ocean. Shell was not able to achieve its goal and did not complete any exploration wells. The company was unable to obtain certification of its containment vessel, and both of Shell’s drilling rigs experienced marine transport problems, including the grounding of the Kulluk off Alaska’s Kodiak Island during a towing operation. A subsequent federal government review of Shell’s 2012 operations concluded that before it is allowed to approach Arctic drilling again, the company must submit to the Interior Department a comprehensive, integrated plan describing every phase of its operation from preparations through demobilization. Shell did no drilling in U.S. Arctic waters last year. “Weeks after the 25th Anniversary of the Exxon Valdez oil disaster, and days after the fourth anniversary of the BP Deepwater Horizon disaster, those environments remain forever altered and communities continue to struggle against oil company obfuscation. To allow the same thing to happen again in pursuit of bigger profits for the world’s largest corporations is insane,” Deans said. Nearly five million people from around the world have signed the Greenpeace petition to protect the Arctic, calling on governments to create a global sanctuary around the North Pole, and to ban offshore drilling and destructive commercial activity in the fragile Arctic environment. Saturdays, through June 28, 12 – 1 p.m.
Sunday, May 4, 2014, 8 a.m.
Guide: NYC Audubon, Van Cortlandt Park Conservancy With the Van Cortlandt Park Conservancy Meet at Van Cortlandt Nature Center. The history of birding and Van Cortlandt Park are inseparable. Influential birders such as Roger Tory Peterson and Allan D. Cruickshank got their starts on Van Cortlandt’s ecologically diverse grounds. These walks celebrate the tradition set forth by these great ornithologists. Participants will look for various species of residents and migrants and discuss a wide range of avian topics. Guide: Chrissy Word With Rocking the Boat Meet at Rocking the Boat, at 812 Edgewater Road in the Bronx, and launch from the adjacent Hunts Point Riverside Park. Explore the Bronx River aboard a hand-built wooden boat, led by experienced rowers. The Bronx River is the City’s only true river and hosts an abundance of wildlife, including herons and egrets, osprey, and belted kingfishers. 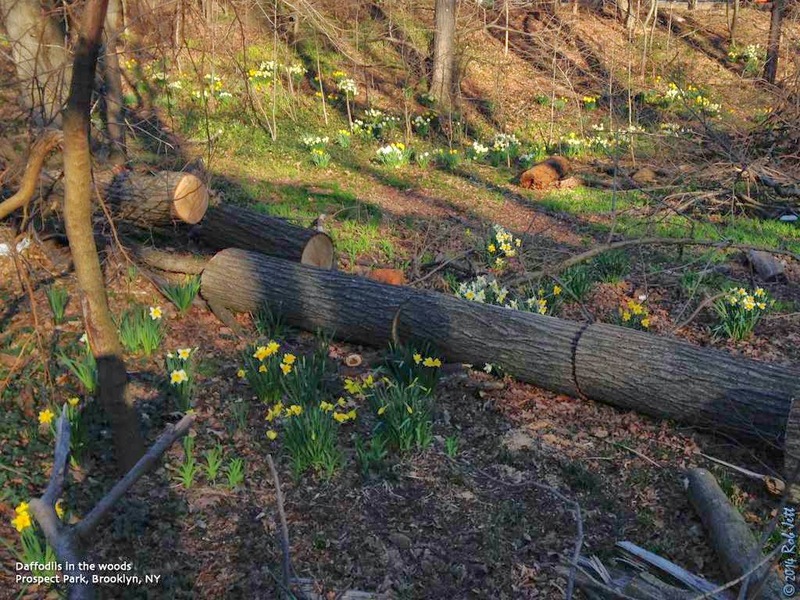 Visit restoration sites and learn about the Bronx River eco-system and the area’s history. rowing optional. Limited to 20. $45 (31) for adults, $35 (24) for ages 18 and under Click here to register. Saturday, May 3, 2014, 9:30 a.m. to 3:30 p.m. Enjoy walking at a comfortable pace to see wonderful vistas, beautiful, spring woodlands. The hike begins at the Greenbelt Nature Center, 700 Rockland Avenue. Bring lunch, a beverage and sturdy walking shoes. Saturday, May 3, 2014 – 1:00 P.M. to 3:00 P.M.
With its bluffs nestled 85 feet above sea level, Mt. Loretto is home to beautiful vistas of the shore facing Prince’s Bay. The shoreline is home to some of Staten Island’s most unique natural artwork. Nestled in the meadow’s hills are a variety of plants and wildlife. Mt. Loretto is a habitat for harbor seals, monarch butterflies, wild rabbits, muskrats, ospreys, and on occasion, bald eagles. Meet at the parking lot at Cunningham Road and Hylan Boulevard ( http://goo.gl/maps/3c5Fh ). Please call John Paul Learn at 718-619-5051 or e-mail at john.paul.learn@gmail.com for more information. Sunday, May 4, 2014, 11 a.m to 1:00 P.M. The park is loveliest in the spring. 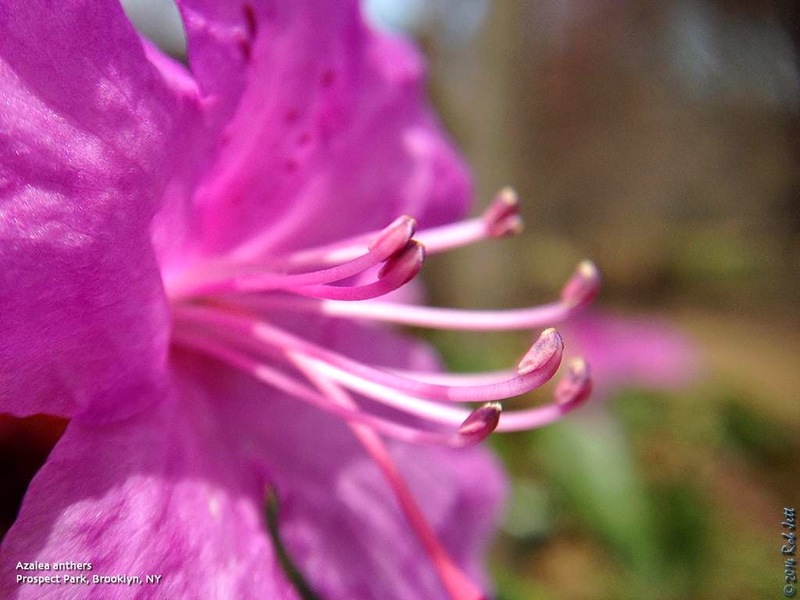 Let’s identify what trees are blooming and see what birds and insects are about. Meet at Silver Lake Park Road and Forest Avenue for a walk across the lake bridge to the trails above. If it’s raining at the time of the walk, the event is postponed to Sunday, May 11, same time. Contact Hillel Lofaso at hlofaso@siprotectors.org for more information. Sunday, May 4, 2014 – 2:00 P.M. to 4:00P.M. 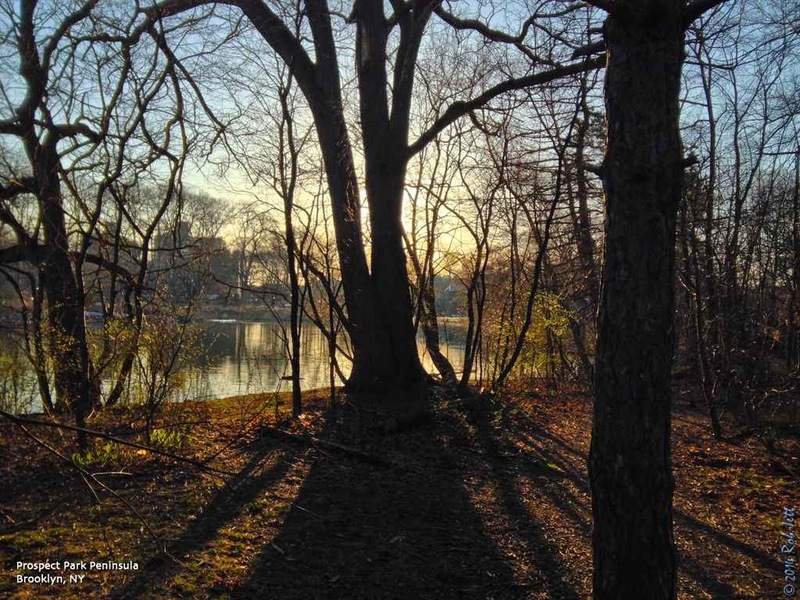 Containing mature upland woods, swamp forest, open marsh, ponds, and shoreline on Raritan Bay, Wolfe’s Pond is one of the most diverse parks in the city. Meet at the comfort stations at the end of the parking lot. The entrance to the parking lot is located off of Cornelia Avenue (http://goo.gl/maps/n8XBa). The Prospect Park Alliance presents Pop-Up Audubon, now in its second season, which invites families to directly engage with nature through outdoor learning in locations around the Park. 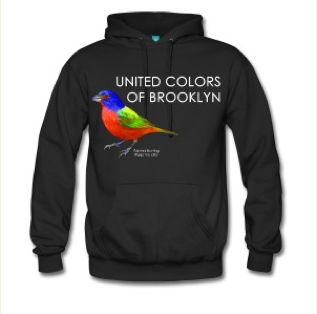 Join the Alliance to learn about the 250 species of birds that call Prospect Park home. 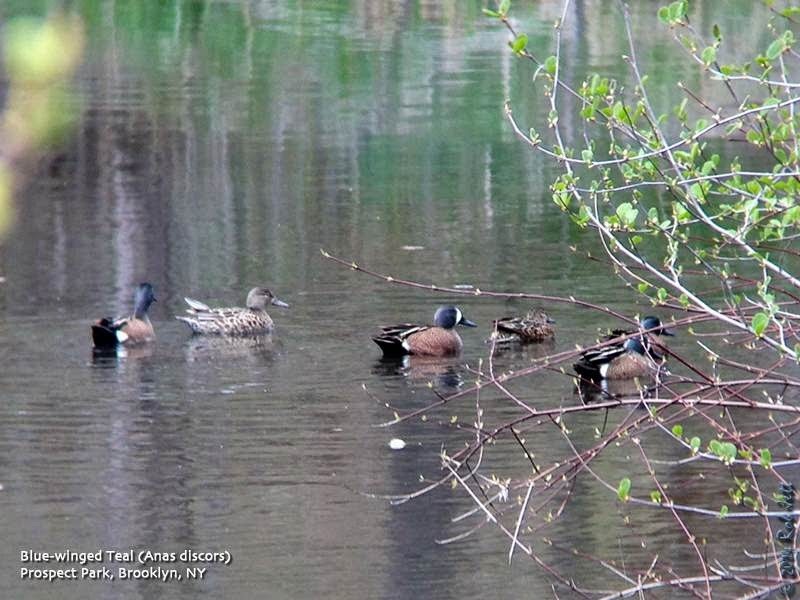 Heidi Steiner, from the Brooklyn Bird Club, will lead this spring bird watching tour around the Ridgewood Reservoir. Binoculars recommended. Join the Prospect Park Alliance to see some of the dazzling birds that visit the Park before flying to northern breeding grounds. The highlights of today’s tape are PROTHONOTARY, YELLOW-THROATED and CERULEAN WARBLERS and other spring migrants and such winter remnants as SNOWY OWL and NORTHERN SHRIKE. A slowly approaching spring has this week provided a slowly increasing number of migrants, with some nice warblers among them. On Wednesday, a YELLOW-THROATED WARBLER was seen in Forest Park, Queens, and a PROTHONOTARY WARBLER was found in Northport on the north shore of Long Island. The YELLOW-THROATED was not relocated after the initial sighting, but the PROTHONOTARY was still present at Fuchs Pond Preserve today. 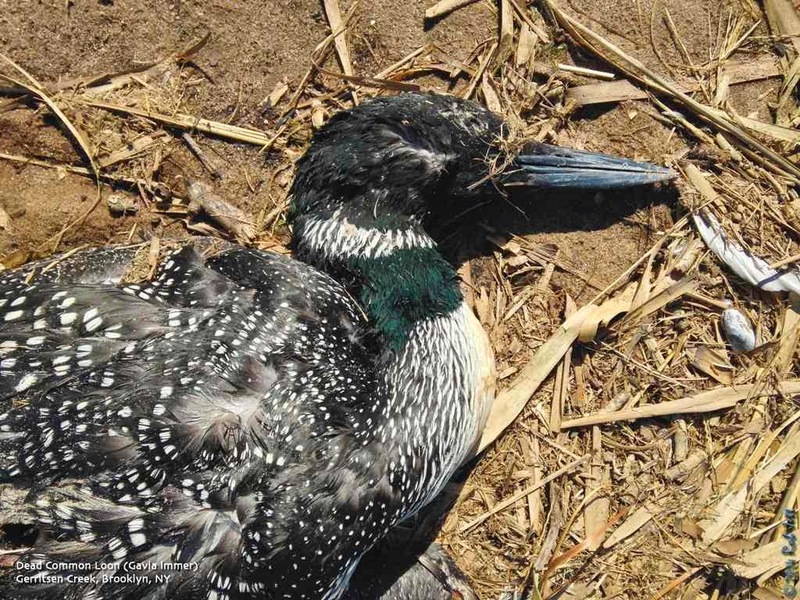 This is an historic location for PROTHONOTARIES, and visitors looking for this bird should do nothing to disturb it. This Preserve is along the Eastern side of Waterside Road, just south of Seaside Court, which goes off to the east – parking is available at this intersection, and a trail from Waterside circles the pond. An early surprise among the warblers was a male CERULEAN spotted Tuesday in Central Park and remaining through Wednesday. Other arriving warblers included an OVERNBIRD last Saturday in Brooklyn’s Greenwood Cemetery, a NASHVILLE WARBLER in Central Park Wednesday, a NORTHERN WATERTHRUSH in Prospect Park Thursday, and a HOODED WARBLER in Greenwood Cemetery today. The Prospect Park WORM-EATING WARBLER continued through today, and also noted in the region were a few more NORTHERN PARULAS and BLACK-AND-WHITE, YELLOW, PRAIRIE AND BLACK-THROATED GREEN WARBLERS. Additional passerines encountered this week included WOOD THRUSH Saturday and YELLOW-THROATED VIREO the day before in Prospect Park and VESPER SPARROW on Eastern Long Island. HOUSE WRENS increased dramatically this week. The season’s first reported WHIP-POOR-WILL was singing early Sunday morning out in Amagansett. The Eastern Long Island Pine Barrens still host a decent number of this species. Central Park on Wednesday produced a SPOTTED SANDPIPER, as well as a WILSON’S SNIPE, and one of a few more arriving RUBY-THROATED HUMMINGBIRDS, and Prospect Park featured the same two shorebirds today. CASPIAN TERNS visiting various ponds and inlets on Eastern Long Island recently included five at Mecox Bay Saturday and two each at Georgica and Sagg Pond. Twenty-two PECTORAL SANDPIPERS were still on the low tide flats by the entrance bridge at Sunken Meadow State Park last Saturday, and an adult BROAD-WINGED HAWK was noted the same day over Connetquot River State Park. Up to six BLUE-WINGED TEAL in Prospect Park this week were joined by a SNOW GOOSE on the lake Wednesday and Thursday. For winter birds, two RAZORBILLS were spotted off Shinnecock Inlet Saturday, a SNOWY OWL was still at Smith Point Park in Shirley Sunday, and the NORTHERN SHRIKE was still present Sunday at Jones Beach West End south of the West End 2 Parking Field. A GLAUCOUS GULL was still along the Brooklyn Waterfront on Saturday. A few lingering RED-NECKED GREBES included three off Floyd Bennett Field Tuesday, and late in the week RED-HEADED WOODPECKERS were still at Greenwood Cemetery in Brooklyn, Kissena Park in Queens and in Rye, Westchester County, and another was spotted in Forest Park today. The Blue-winged Teal is a member of the waterfowl genus "anas", which includes mallards, wigeons, teals, pintails and shovelers. Their preferred habitats are calm water bodies such as inland marshes, lakes, ponds, pools, and shallow streams with dense emergent vegetation rather than large open water and fast currents. They are usually the first ducks to head south in the autumn and the last to head north in the spring. Blue-winged Teal currently breed in New York State, primarily in the St. Lawrence Valley and Lake Plains regions, although their numbers have been declining. For the second week in a row my Wednesday morning Green-Wood Cemetery tour was met with less than ideal spring migration weather. The skies were clear and beautiful, but north-west winds gusting to 35 mph made it feel more like early-March than late-April. Cold and wind aside, there were still some highlights to report. "RHWO exhibits 3 structurally distinct vocalizations. For convenience, these are arbitrarily termed Vocals 1, 2 and 3. Vocal 1 is a discrete call while the others exhibit both discrete and graded characteristics. Vocal 2 is the most gradated with the extreme of gradation associated with agonistic circumstances. All of the vocalizations, with the exception of Vocal 3, are limited to the breeding season. All three vocalizations are used by males. Females do not exhibit Vocal 1. Both sexes employ Vocals 2 and 3. Once the territory is fully established and pair bonding is complete, acoustic activity declines, especially when incubation commences." I didn't find this too helpful, but you can read the entire piece, "Brief Overview of Sexual Dimorphism, Monochromaticism and Acoustic Repertoire of the Red-headed Woodpecker", here. Since my last visit to the cemetery the magnolias and cherry trees have really popped. For the first hour of the walk we didn't find too much bird activity, but the blossoms were a nice second prize. We finally came across a small mixed flock of songbirds on the steep, wooded Bluff Side Path above the Sylvan Water. In the trees above we counted Blue-headed Vireo, Blue-gray Gnatcatcher, Ruby-crowned Kinglet, Palm Warbler, Pine Warbler and Yellow-rumped Warbler. Descending the ridge to the lake we found a mixed flock of swallows braving the strong winds and skimming back and forth in the air above the Sylvan Water. Normally fairly active during the spring, the wooded hillside on the south side of the lake was pretty quiet. It wasn't until we ascended Oaken Bluff, towards Horace Greeley, that we stumbled on the second songbird flock of the morning. Seven Palm Warblers were foraging on the ground beneath a stand of conifers. A still bare dogwood tree just beyond the flock held another gnatcatcher and vireo. After a moment I spotted my first Black-and-white Warbler of the season. Normally, finding a black-and-white in Brooklyn on April 23rd is not a big deal, but spring migration so far has seemed a little slow. 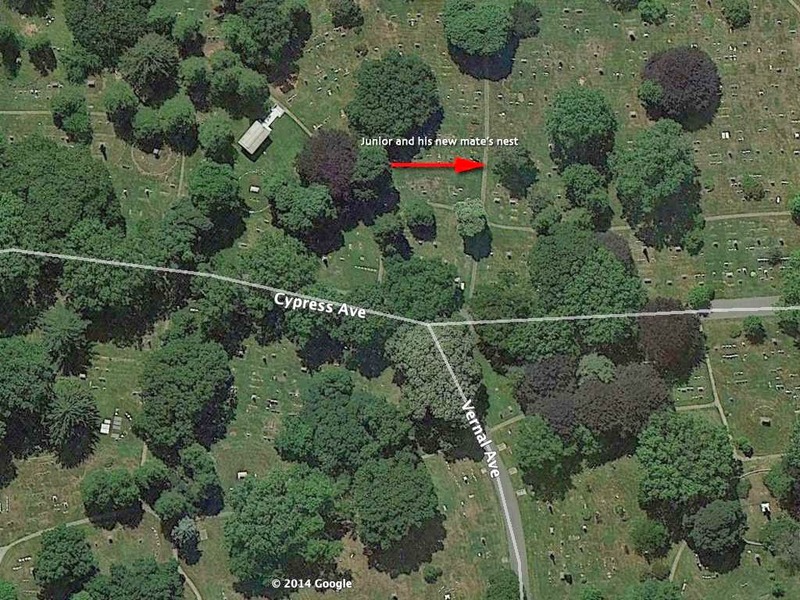 On past Green-Wood Cemetery trips around this date I've tallied between 5 and 8 different species of warbler. Maybe things will pick up a bit more this weekend. To read about what birds are moving and migration forecasts, check out Cornell's BirdCast forecasts here. Comments: My weekly cemetery tour. Since my posting about our Brooklyn's nesting Red-tailed Hawks here, I received a couple of updates. I just read your post and have some information for you. I do not know about this or last year for sure but 3 years ago there was a confirmed pair with a single offspring. I rescued the early fledged baby after it left the park on its own and was discovered sitting for hours on the stoop of a brownstone directly across the street from the park on Washington Park Ave. Park Rangers had been monitoring the nest in a huge tree at the top of the hill in the middle of the park directly across from the monument. A few days before we got the fledgling the rangers picked up a sick adult male red-tail in the park. Unfortunately it died the next day from a severe case of frounce. They never saw any other adult return to the nest so after a few days I guess of no food the youngster jumped out rather than sit there and starve to death, as any orphaned baby bird will do once hungry. He was very underweight when we rescued him but months later he was released in Prospect Park along with Urban Park Rangers. I will try to find out more about the possibility of a new pair there and pass along any news if I get any. I also receive an email and photo from Pam Langford regarding the Brooklyn Botanic Garden hawks. The BBG red-tailed hawk pair appears to be nesting in the Japanese garden. Today my friend Jan Kraus and I spotted a hawk flying into a pine tree near the entrance to the Japanese garden (by the cherry esplanade). It's not easy to see, but after watching a while we saw a hawk in the nest, and later there was a swap when a second hawk arrived and the hawk on the nest flew away. No way to know how far along things are, but the pair appears to be attending either eggs or youngsters. There is a nest of some sort near last year's nest tree by the BMA parking lot, but it is not very big. Perhaps they built two nests this year? In any case, I am hoping for another delightful summer with fledglings in the botanic garden. WASHINGTON — The Obama administration is putting off its decision on the Keystone XL oil pipeline, likely until after the November elections, by extending its review of the controversial project indefinitely. In a surprise announcement Friday as Washington was winding down for Easter, the State Department said federal agencies will have more time to weigh in on the politically fraught decision — but declined to say how much longer. Officials said the decision will have to wait for the dust to settle in Nebraska, where a judge in February overturned a state law that allowed the pipeline’s path through the state. Nebraska’s Supreme Court isn’t expected to hear an appeal to that ruling until September or October, and there could be more legal maneuvering after the high court rules. So President Barack Obama will almost surely have until after the November congressional elections to make the final call about whether the pipeline carrying oil from Canada should be built. Approving the pipeline before the election would rankle Obama’s allies and donors in the environmental community, but nixing it could be politically damaging to vulnerable Democrats running this year in conservative-leaning areas. “This decision is irresponsible, unnecessary and unacceptable,” said Democratic Sen. Mary Landrieu, who faces a difficult re-election in oil-rich Louisiana. Landrieu said Obama was signaling that a small minority can tie up the process in the courts, sacrificing 42,000 jobs and billions in economic activity. In an ironic show of bipartisanship, Republicans joined Landrieu and other Democrats like Sen. Mark Begich of Alaska in immediately condemning the announcement — the latest in a string of delays in a review process that has dragged on for more than five years. Senate Minority Leader Mitch McConnell, R-Ky., accused Obama of kowtowing to “radical activists” from the environmental community, while House Speaker John Boehner, R-Ohio, called the decision “shameful” and said there were no credible reasons for further delay. “This job-creating project has cleared every environmental hurdle and overwhelmingly passed the test of public opinion, yet it’s been blocked for more than 2,000 days,” Boehner said in a statement. Keystone XL would carry oil from western Canada’s tar sands to refineries on the Texas Gulf Coast. The project requires State Department approval because it crosses an international border. The State Department vowed to move forward with other aspects of its review even while the situation in Nebraska remains in limbo. “The agency consultation process is not starting over,” the State Department said in a statement. State Department officials said other U.S. agencies, such as the Environmental Protection Agency, won’t be notified of their new deadline for comment until the legal situation in Nebraska becomes clearer. Driving the delay is a concern that the legal wrangling could lead to a change in the pipeline’s route that would affect agencies’ assessments, said the officials, who weren’t authorized to comment by name and demanded anonymity. The White House has insisted that Secretary of State John Kerry is in charge of the process, which involves a determination about whether the pipeline is in America’s national interest. But Obama is widely expected to make the final call. In a nod to environmentalists’ concerns, Obama has said the pipeline will be deemed not in the U.S. interest if it contributes significantly to increasing carbon dioxide emissions that contribute to climate change. Environmentalists argue that the oil that’s pulled out of Canada’s tar sands is among the dirtiest on the planet. The White House declined to comment on the State Department’s announcement, which came on Friday afternoon, when many Americans were observing Good Friday. Sen. Lisa Murkowski, R-Alaska, accused the administration of “a stunning act of political cowardice” by waiting until most Americans would be too busy preparing for Easter or observing Passover to notice the delay. This isn’t the first time that machinations in Nebraska have delayed a Keystone XL decision. The pipeline’s initial route had to be redrawn to address concerns that it would threaten the Nebraska Sandhills, a region of grass-covered dunes used as ranchland. “We are disappointed that politics continue to delay a decision on Keystone XL,” said Jason MacDonald, a spokesman for Canadian Prime Minister Stephen Harper. The pipeline project has become a proxy for a larger battle between environmental activists and energy advocates over climate change and the future of American energy — much to the dismay of Calgary-based TransCanada Corp., which has proposed the pipeline. The company’s CEO, Russ Girling, said the company was “extremely disappointed and frustrated” with the latest delay. Environmentalists’ hopes that Obama would reject the pipeline were dealt a blow in January when the State Department, in a highly anticipated environmental report, said that building the pipeline would not significantly boost emissions because the oil was likely to find its way to market one way or another. The State Department concluded that transporting the oil by rail or truck would have an even worse environmental affect than building the pipeline. Associated Press writers Bradley Klapper and Matthew Lee in Washington, Grant Schulte in Lincoln, Neb., and Charmaine Noronha in Toronto contributed to this report. Celebrate Earth Day in Jamaica Bay! With the American Littoral Society, Jamaica Bay Ecowatchers and the Broad Channel Civic Association. Join us for a fun day of educational and community service events in Broad Channel, Queens. Bring your children, friends and family to help make our community spaces greener and to help our salt marsh habitats thrive this year! Jamaica Bay Wildlife Refuge Walk 10 AM - 12 Noon. Sunset Cove and American Park Community Cleanup 12 PM - 3 PM. Join us for a community cleanup of Sunset Cove and American Park. At 12 PM we will give a short talk about the Marsh Restoration Initiative , a multi-year Jamaica Bay project co-led by the American Littoral Society and the Jamaica Bay Ecowatchers, whose mission is to restore Ruler's Bar and Blackwall Marsh islands, along with news about future habitat restoration initiatives that we hope to achieve with your help and support. Meet at the American Ballfields parking lot. All cleanup volunteers are eligible to win two free concert tickets to see world famous musician, Jack Johnson, perform at Jones Beach Theatre on Saturday, June 7th, 2014, courtesy of Skraptacular and the Johnson Ohana Charitable Foundation. To be eligible, you must register in advance for the cleanup and check in at our registration desk the day of the cleanup. click here to register. The ticket winner will be announced on our Facebook page, so please "Like Us" on Facebook! For sponsorship opportunities, please contact: cathy@littoralsociety.org. Classes: Wednesdays, April 9, 16, and 23, 6:30-8:30pm Trips: Saturdays, April 19 and 26, Times TBA Instructor: Tod Winston Learn the keys to identifying the spectacular variety of birds that migrate northwards through New York City every spring. Even if you've never picked up a pair of binoculars, you’ll soon be identifying warblers, thrushes, waterbirds, and more—both by sight and by ear. Three fun and educational in-class sessions and field trips to Central Park and Jamaica bay (transport to Jamaica bay included). limited to 12. $160 (112) Click here to register! Saturday, April 26, 2014, Noon to 2:00 P.M.
Meet at the first parking lot about a quarter mile from the entrance to Great Kills Park. From the starting point near where the bath house once stood we will explore the shoreline and peat flats to discover which species of intertidal life are active in the spring. Please dress appropriately for walking in this environment. Sunday, April 27, 2014, 1:00 P. M. to 3:00 P.M.
Past and present blend in the Conference House Park where history stretches back thousands of years with the seasonal occupation of the Lenape and hundreds of years with the habitation of the Dutch and English. In addition to the local history we’ll observe the geology, as well as the plants and animals found in the park. Meet at the parking lot at the end of Hylan Boulevard on the left. We'll explore our wetlands and woodlands in search of resident and migratory birds. Come check out some of the best birding spots in Manhattan and learn how New York Restoration Project’s approach to landscape management supports these populations. Greetings. This is the New York Rare Bird Alert for Friday, April 18 at 6:00 pm. The highlights of today’s tape are SWALLOW-TAILED KITE, WHITE-WINGED DOVE, SUMMER TANAGER, YELLOW-THROATED WARBLER, SNOWY OWL, CASPIAN TERN and spring migrants. Finally, this week the unusual winter holdovers gave way to some nice spring rarities, with three good southern overshoots appearing before winter came back again later in mid-week. Topping the list certainly was SWALLOW-TAILED KITE, with two Monday sightings of what is one of the world’s greatest and most distinctive birds. But, like virtually every other New York appearance, these sightings were very fortuitous and very brief. The first was seen about 8 am Monday morning over the Southern State Parkway near its intersection with the Wantagh Parkway, and the second appeared briefly over the Lullwater in Prospect Park, Brooklyn around 9 am, visible long enough for a diagnostic photo to be taken. 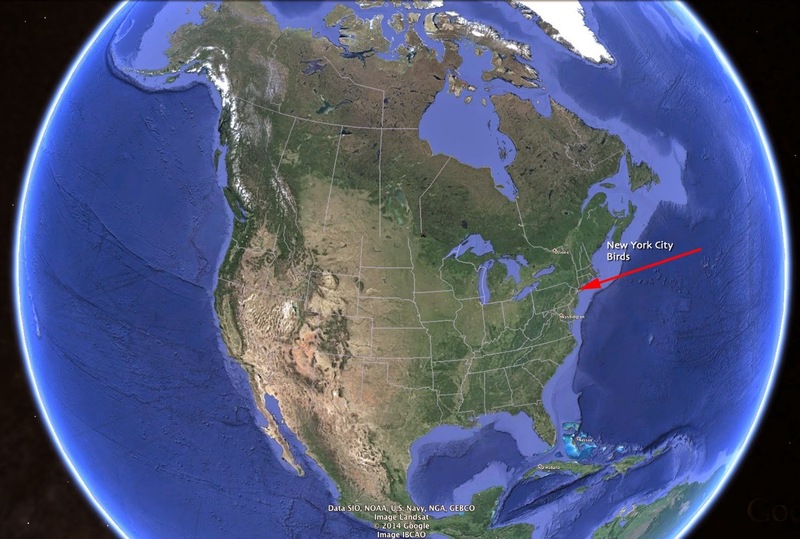 These sightings might involve the same bird, though the first was reported moving East. Hopefully one day one will stay in New York long enough to be enjoyed by many - a free dinner to the finder of that bird. Two southern passerines appearing on Sunday were a YELLOW-THROATED WARBLER spotted near the Lower Pool in Prospect Park and a male SUMMER TANAGER seen briefly at the Lenoir Preserve in Yonkers. Another interesting bird was a WHITE-WINGED DOVE appearing Sunday around a private home in Montauk - and the source of this species in the Northeast remains more mysterious. A CASPIAN TERN visited Mecox Bay from last Friday through Monday, and an increasing number of spring arrivals, mostly expected, have included TRICOLORED HERON as of last Friday, CLAPPER RAIL and FORSTER’S TERN both at Oceanside Marine Nature Study Area Sunday, BROAD-WINGED HAWK from Saturday, some WILLETS, SHORT-BILLED DOWITCHER at Captree yesterday, and a RUBY-THROATED HUMMINGBIRD on Eastern Long Island Sunday. Increasing numbers of LAUGHING GULLS and CHIMNEY SWIFTS were also noted. Among the passerines appearing recently have been an EASTERN KINGBIRD reported last Sunday and WHITE-EYED VIREO in Prospect Park last Saturday, as well as a few more BLUE-HEADED VIREOS and HOUSE WRENS. Newly arrived warblers featured a WORM-EATING WARBLER in Prospect Park Wednesday to today, PRAIRIE WARBLERS in both Central and Prospect Parks, ORANGE-CROWNED WARBLER reported from Bellmore Monday, a YELLOW WARBLER at Hempstead Lake State Park, a COMMON YELLOWTHROAT or two, and a BLACK-THROATED GREEN on Staten Island today. Also increasing were BLACK-AND-WHITE, NORTHERN PARULA, and PALM. On the winter front, last Saturday still found two SNOWY OWLS at Jones Beach West End and one at Orient Beach State Park, and a few RED-NECKED GREBES included another visiting Central Park Reservoir to Thursday. A GLAUCOUS GULL was still at Coney Island Creek in Brooklyn Monday and Wednesday, with single LESSER BLACK-BACKS over Greenwood Cemetery in Brooklyn Monday, at Floyd Bennett Field Tuesday, and at Heckscher State Park today. A late RAZORBILL was moving east off Robert Moses State Park this morning. RED-HEADED WOODPECKERS were still in Brooklyn at Greenwood Cemetery and Marine Park Saturday, with others at Pelham Bay Park in the Bronx Sunday, at Muttontown Preserve Monday and in Rye today. 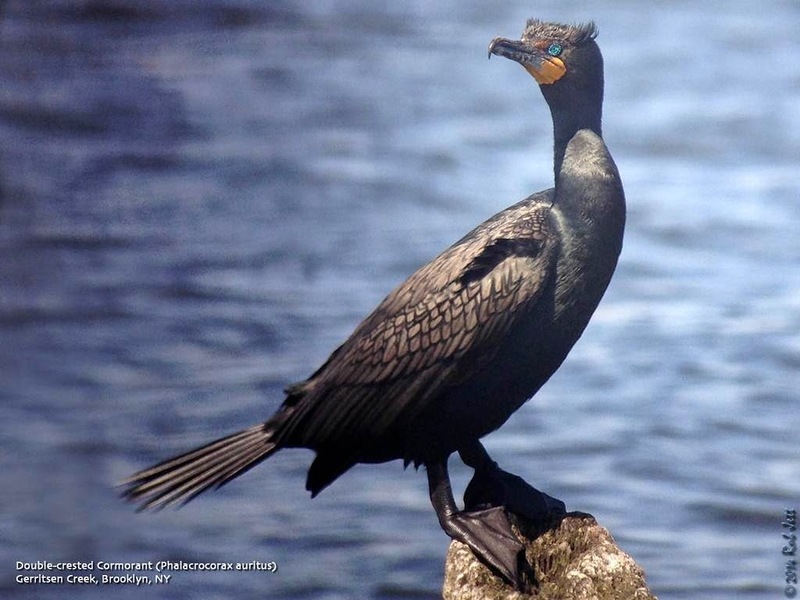 Over the last week or two large flocks of Double-crested Cormorants can be seen migrating through or to New York City. Relatively scarce around the five boroughs during the winter, they are replaced during the cold months by Great Cormorants. Several of the islands that dot New York Harbor or the Long Island Sound north of the city are home to large colonies of breeding double-cresteds. This bird is one of several species that are part of the New York City Audubon Society's Harbor Heron project. As a defense mechanism cormorant nestings will vomit on a perceived threat, so approach a nest colony forewarned. Yesterday I led a Green-Wood Cemetery birding tour, which should have been a typical mid-April spring trip. I expected to see a few species of warbler and other migrants songbirds. Mother Nature had other ideas. At this time of year I usually hear the sound of songbirds outside my window in the early morning hours. Yesterday, though, I was awakened by the sound of car owners with plastic scrapers removing ice and snow from their vehicle's windows. The temperature at the start of the trip was 30º f. With nearly 25mph wind gusts it felt more like 17º. 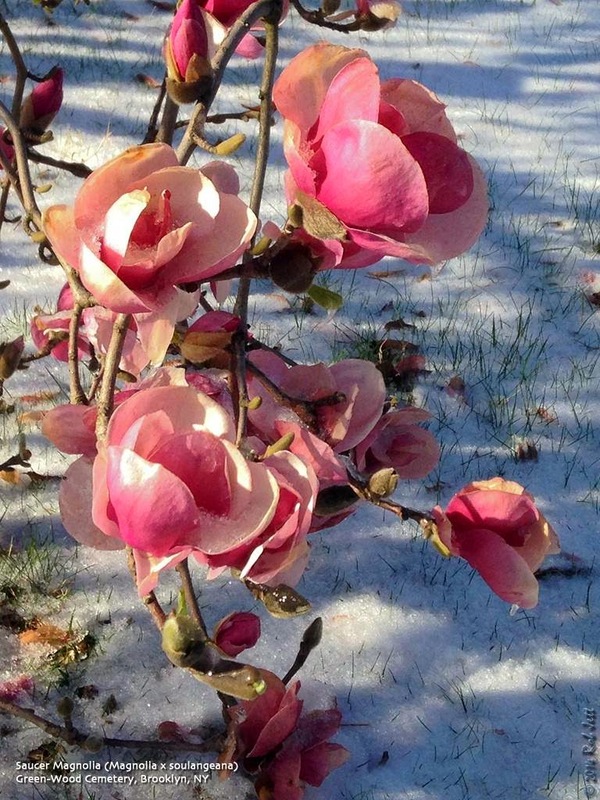 The sky was bright and clear, however, with a few feathery clouds, so if you didn't feel the wind or know the temperature, you might have thought that is was a beautiful Spring morning, that is until you noticed the icy sheen on the sidewalks and thin layer of crusty snow on the grass. Still, it IS spring migration and there are birds out there to be discovered. The overwintering Red-headed Woodpecker was still present in his usual haunts just inside the main entrance to the cemetery. He is now in adult plumage and actually vocalized for us while clinging to the side of "his" tree in front of the cavity he excavated back in November. I guess he is hoping for a female to pass through the neighborhood. He might have a very long wait as I haven't found any documentation of this species ever nesting in Brooklyn. Any north or west facing hills were being blasted by pretty strong and frigid winds, so I mostly concentrated the morning walk to the cemetery's dells and leeward sides of the ridges. 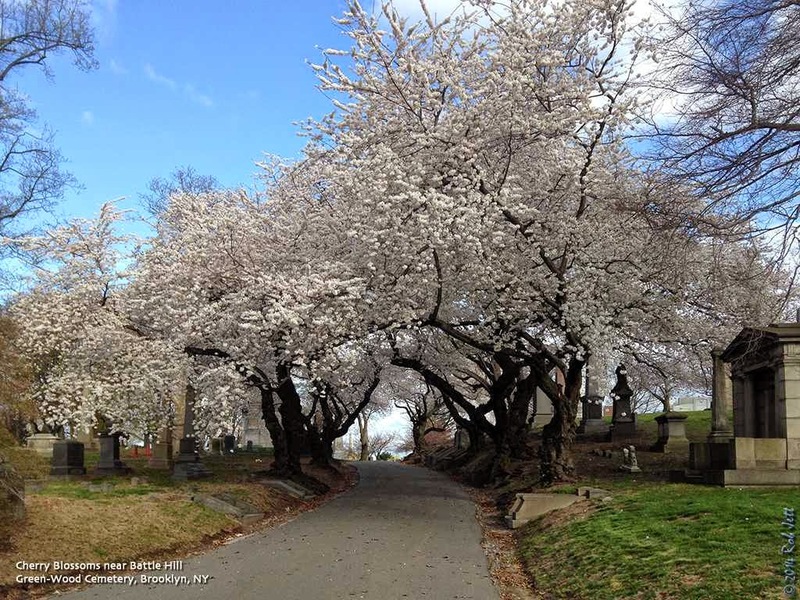 Many of the magnolia trees in the cemetery have begun flowering and I noticed a pale green hue developing on the maple tree's crowns as they have just started to bloom. Keep an eye on the maples and oaks over the next week. As warbler numbers begin to increase, the flowers of these trees will attract the insects on which these colorful birds feed. Given the wind conditions, I wasn't surprised that I had a hard time finding any warblers. 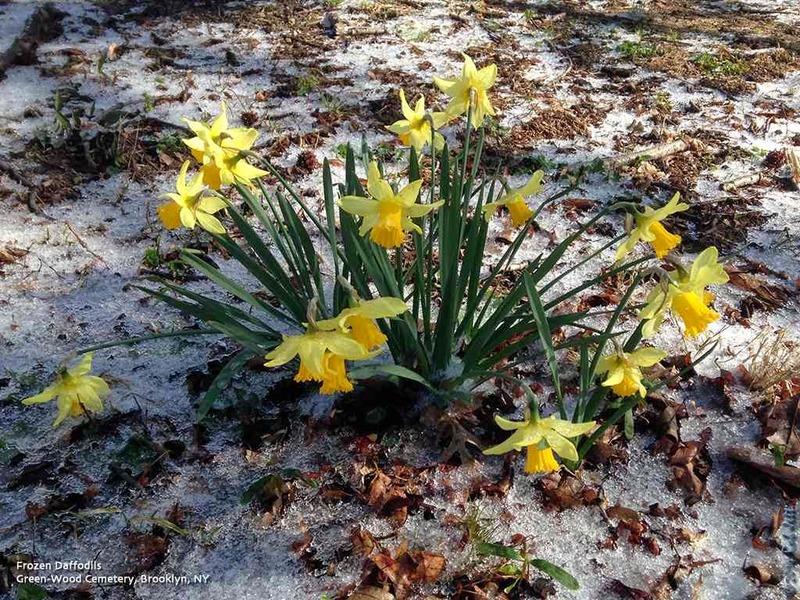 Daffodils were wilting under the weight of ice on their petals and trees creaked as they swayed. A small flock of Tree and Barn Swallows skimmed back and forth across the Sylvan Water. A silent Belted Kingfisher flying across the pond had me fooled as his normal flight pattern had changed to adapt to the buffeting winds. Unlike my weekend experience, I couldn't find one warbler around the edges of the pond. There was a marked increase in arriving Blue-gray Gnatcatchers, however. Seeing several gnatcatchers under these weather conditions seemed a bit incongruous or unlucky ... for them. These tiny, hyperactive songbirds are, on average, 4.5 inches long, nearly half of that is just their tail. They weigh in at about 6 grams. That's a bit less than the weight of three U.S. pennies. Their wheezy, chattery song perfectly matches their cute, diminutive size. As I watched this teensy bird foraging for insects there were times it seemed to be completely immune to the wind. Perhaps it is exactly their lack of mass and wind resistance that allows them to move around in the gusts almost effortlessly. 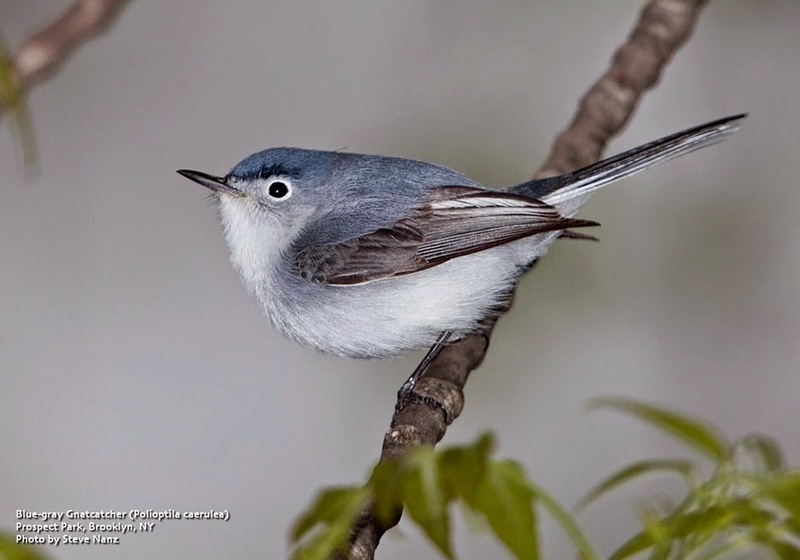 Conversely, my upright body on a bicycle, pedaling against the wind and uphill after the walk probably burned more calories that a Blue-gray Gnatcatcher might on the entire 2,000+ mile migration from its wintering home in Honduras to Green-Wood Cemetery in Brooklyn. I can't wait until normal spring weather. Comments: Weekly tour. Temps around 30º, winds N-NW at 15-20mph. Last weekend I did a little spring birding at Prospect Park, Green-Wood Cemetery, Coney Island, Coney Island Creek Park and Gerritsen Creek. Like the previous weekend, my Saturday birding agenda kicked off at pre-dawn. I like to be where the birds are when the sun comes up, so was walking into Prospect Park just as the sky was lightening from black to navy. Robins, cardinals and House Sparrows had already been singing for 30 minutes. The annual mockingbird at the end of my block must be late to arrive as I haven't heard his 3am concert. I was optimistic that there would be a nice mix of warblers and other migrant songbirds vocalizing in the park at this early hour and couldn't wait to get started. I was kind of hoping to find something really interesting before 6am. That way I could use my Twitter account like an alarm clock for any followers who opted to sleep in on a beautiful spring morning. Luckily for them that didn't happen, though, and my first tweet didn't go out until 6:28am. We were standing at the Lily Pond, just upstream from the nature center when we spotted a Louisiana Waterthrush. I heard the weak trill of a Palm Warbler and the high-pitched rising scale and chatter of a Ruby-crowned Kinglet. I would hear several through the morning. We noticed some activity in the trees at the back of the pond and walked over for a closer look. Within a moment or two we spotted Blue-headed Vireo, Golden-crowned Kinglet, Ruby-crowned Kinglet, Palm Warbler, Pine Warbler and Yellow-rumped Warbler in the trees at the edge of the pond. After about 20 minutes we headed towards the nature center. Standing near the concrete "duck feeding station" I heard the raspy "skeow" call of a Green Heron, but couldn't see the source. Mustering my best impression of the "skeow" call, I was shocked with the bird flew up from the edge of the water and headed directly towards me. My first thought was how narrow this small wading bird looked straight on, sort of like a dart. My second was whether I should duck as he looked like he was coming right at my head. At the last moment he ascended into a tree above and behind me. I never realized I was so gifted at calling in Green Herons, but I think I'll leave that talent off of my resume. Green-Wood Cemetery was the next stop after 2 good hours in Prospect Park. There were lots of both species of kinglets present, but for the most part the cemetery was fairly quiet. The one exception was the area around the edges of the Sylvan Water. A lone cherry tree at the southeast edge of the pond was loaded with hungry warblers. Around a dozen Palm Warblers, a several Pine Warblers and a few Yellow-rumped Warblers chased down insects amongst the trees pink blossoms. A Northern Parula flew in from the shrubs across the road and joined the feeding frenzy. Teetering along the shore at the edge of the pond was a fifth warbler species - a Louisiana Waterthrush. By the time we left the cemetery it was late morning and the songbird activity was beginning to slow down. We decided to go to Coney Island to look for migrating seabirds and shorebirds. One of our target birds at the shore was Northern Gannet. From the edge of the jetty at the end of West 37th Street we scanned back and forth across the water. There were lots of Brants and a couple of dozen Common Loons. A single Purple Sandpiper foraged for arthropods within the jetty's green-fringed boulders. It took about 15 minutes, but eventually a lone gannet was spotted soaring over the bay. A few minutes later we were scanning the water off the end of Stillwell Avenue. There were more loons in the water here, 19 to be exact, and a few Horned Grebes. 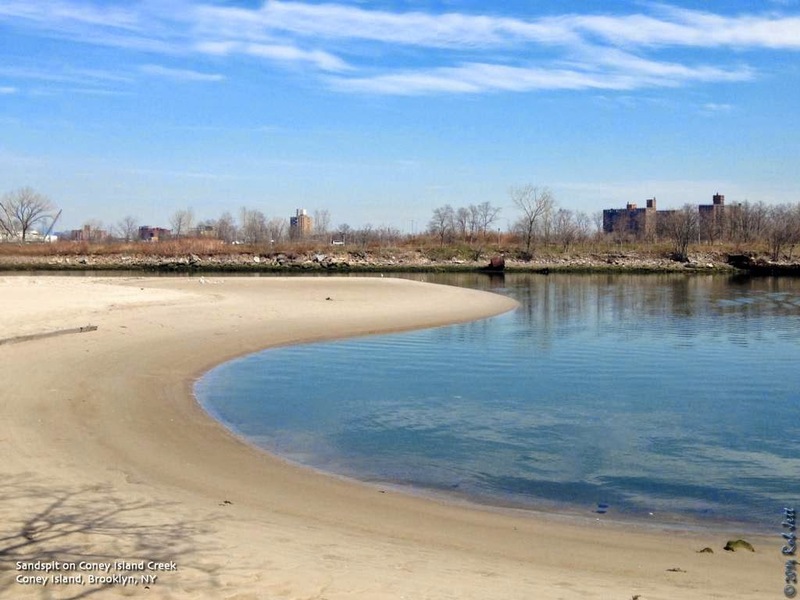 Coney Island Creek Park is at the northern end of West 37th Street. It has a narrow strip of trees and low vegetation adjacent to the sand dunes that border Gravesend Bay. On a good spring migration morning it attracts a surprising diversity of birds. Saturday was not one of those days. 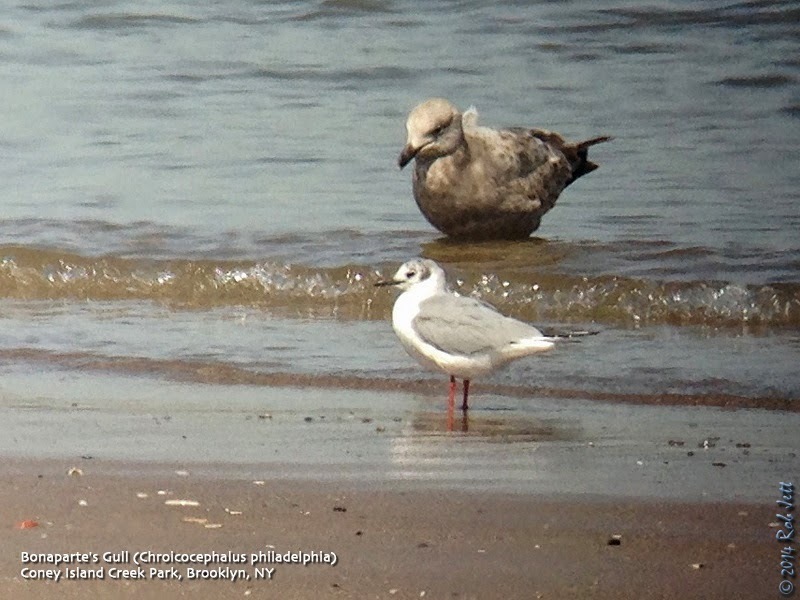 One surprise was spotting a pair of lingering Bonaparte's Gulls on the shore. I had been standing a shore distance from them for probably 10 minutes before I noticed. After a long, brutally cold winter of chasing gulls in this area, I was sort of done with "gull mode" and was focusing on everything else. A short distance east of the park is the actually creek. It's usually a good spot to see a nice mix of waterfowl. A sand spit here is a great winter spot for gulls. Neither the spit nor the water held many birds. A single Red-necked Grebe remained in the area. Normally spotting the grebe would be a big deal. As a friend recently pointed out, this winter's irruption of Red-necked Grebes has New York birders a bit "grebed out". I was optimistic that I'd find my first Blue-winged Teal of the year on the creek, but I guess that will have to wait for another day. My final stop during Saturday's long day was Gerritsen Creek, in Marine Park. The hope was to find a few wading birds, maybe a tern or two and a couple of shorebirds. One of the first year birds found on our walk down the west side of the creek was a Forster's Tern. The bird was perched on a wooden piling exposed by the low-tide. Later we spotted our first Snowy Egret of the season. Migrating Common Loons were relatively abundant and seen in multiple locations during the day. Unfortunately I also stumbled (literally) on this dead one along Gerritsen Creek's shore. I'd never seen one up close and was surprised to learn that the dark collar is actually an iridescent green color. I was about to hop on my bike and ride into the park to find this rare bird until I received this follow up. I had about 10 minutes to spare, so re-dressed, grabbed my bins and bicycle and pedaled into Prospect Park. It wasn't difficult to find the warbler as there was at least a dozen people with their bins trained on it. I would have liked to linger and watch the bird for a while, especially considering that, if you're lucky, you only get to see one a year. I said hello to a few people, but really had to rush back home. When I bid everyone "good birding" and clipped into my pedals, my friend Dennis captured the sentiment of spring migration craziness when he said to me, "And here we are again..."
It has been a while since I've posted any updates on our local Red-tailed Hawk pairs. Sometimes the revolving seasonal bird activity distracts me from the one species that got me started in birdwatching. Perhaps it is because what seemed unusual to me over 20 years ago has become common place. 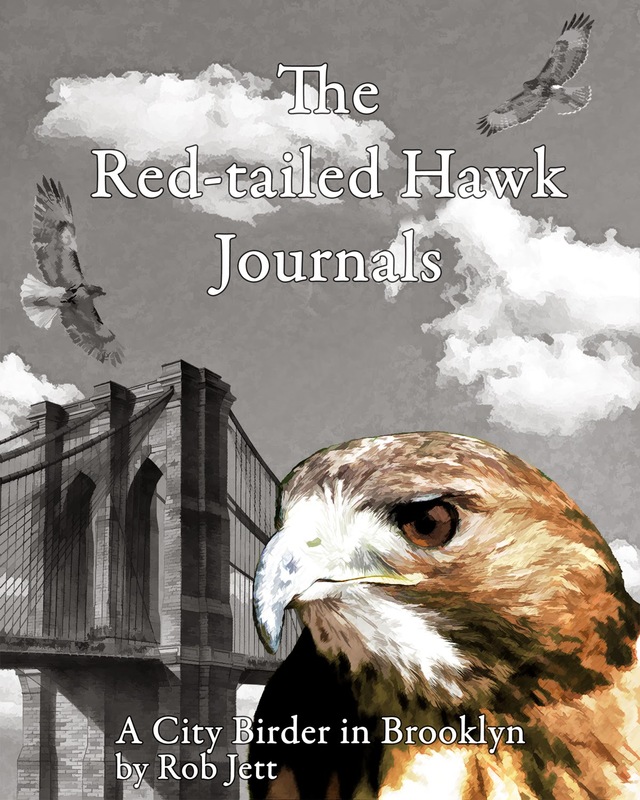 Barely a day passes that I don't notice at least one Red-tailed Hawk around Brooklyn or NYC's other boroughs. As my knowledge of and interests in other family of birds evolves, I still enjoy periodically going back and tracking down Brooklyn's hawks. There are three nesting pairs in and around Prospect Park and a possible fourth pair at Fort Greene Park. 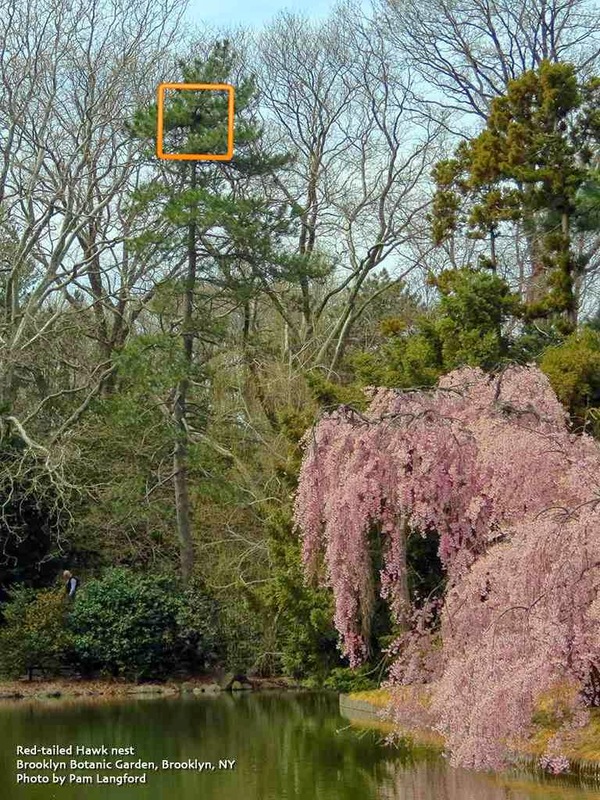 A pair at the Brooklyn Botanic Garden has been using a pine tree that borders the Brooklyn Museum parking lot for their nest for a third year. I am guessing that this is the pair named "Nelly" and "Max" who used to nest in a Japanese Black Pine at the edge of Nelly's Lawn in Prospect Park. Nelly and Max stopped using the nest in Prospect Park at the same time the pair showed up across Flatbush Avenue at the botanic garden. "Junior" the long time mate of the late "Big Mama" appears to have moved on. 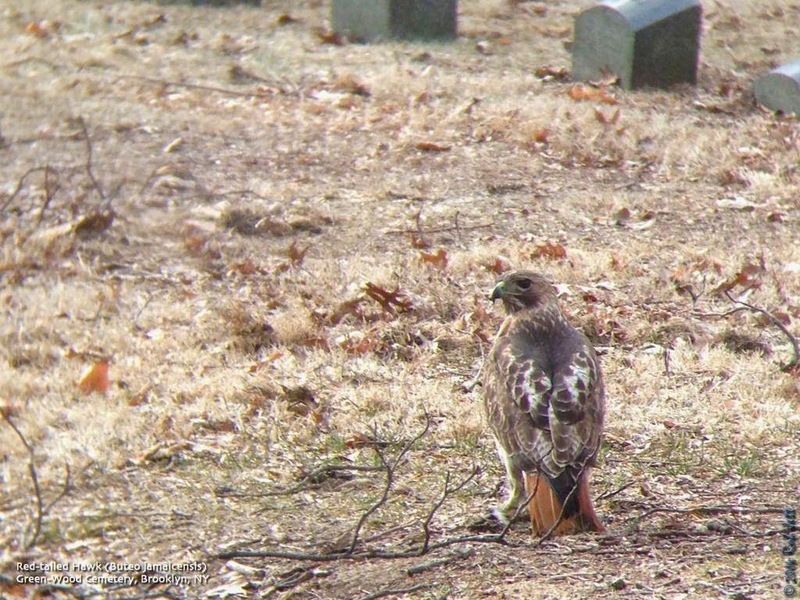 He has taken a new mate and the pair has settled on a nest site in a pine tree on "The Flats" of Green-Wood Cemetery. The nest tree is only about 600 yards south-west of Junior and Big Mama's final nest. That was also a pine tree, but sustained major damage from one of this past winter's storms. As of last weekend, the hawks didn't appear to be incubating eggs yet. The nest is at the very top of the tree and not easy to see. If I find a good viewing vantage point I'll post directions here. 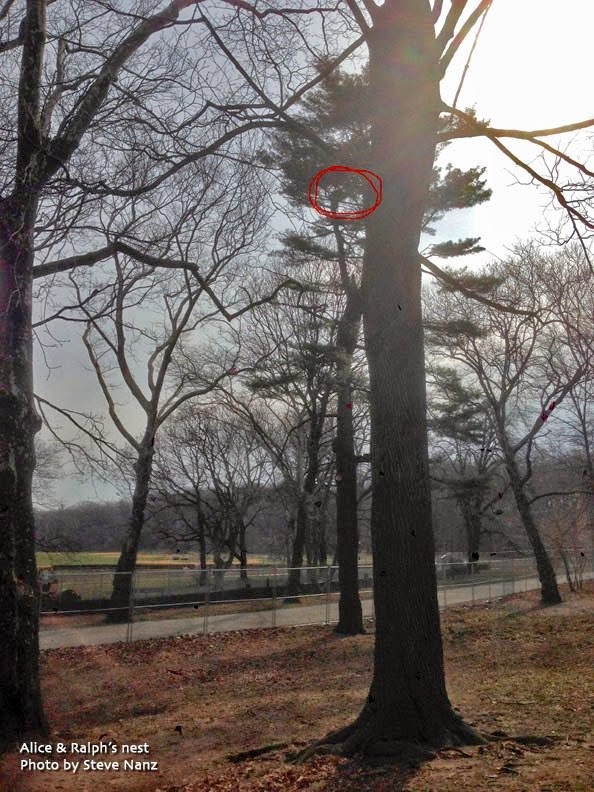 My friend Steve called me on Saturday morning to tell me about a large nest he found in Prospect Park. I was aware that a pair of Red-tailed Hawks had been nesting somewhere in a stand of pines at the south end of the baseball fields a couple of years ago, but had no luck confirming the location. Like Junior's nest in Green-Wood, this nest is near the top of a conifer and very difficult to see. Through Steve's scope, however, we could see that there is a red-tailed sitting on eggs. So, who is this pair? An educated guess would be Alice and Ralph. In 2012 they were unceremoniously evicted from their pine tree nest site of 9 years in the Ravine by a pair of owls. Shortly thereafter I began receiving notes about a pair of red-tails building a nest at the south end of the baseball fields. Intergovernmental Panel on Climate Change has issued their latest report and the message is predictable, but will world leaders act in time. There are choices that need to be made if dangerous climate change is to be avoided in the 21st century. Previous reports from the Intergovernmental Panel on Climate Change (IPCC) have confirmed that the influence of human activities on the climate is unambiguous, and that climate change will have a major impact on human activities and ecosystems. Its third report, published yesterday, sets out the huge challenge that needs to be addressed by policymakers. The evidence is clear: sticking to business as usual will lead to temperature rises of three to five degrees above pre-industrial levels. This will potentially lead to catastrophic effects on water resources and agricultural productivity, and accelerate sea level rise. If momentum is maintained, the pledges made by UN members at the Cancun Climate Convention in 2010 would probably take us to the bottom end of that range, close to a three-degree rise. But they would not meet the two-degree goal set by the UN and accepted as the target needed to avoid dangerous climate change. Hitting the two-degree target has not been ruled out, but the IPCC has concluded in its report that major changes would be needed to energy systems, requiring technological and institutional change on a massive scale. Global emissions of greenhouse gases would need to fall by 40-70% to meet the target. This could imply a tripling or quadrupling, by 2050, of cleaner electricity sources such as renewables, nuclear or fossil fuels, along with carbon capture and storage, and the aggressive pursuit of energy efficiency opportunities. There will be no single solution across the world but rather a patchwork of responses as countries make their own choices. However, the expansion of renewable energy is likely to be ubiquitous. The implications of delay are clearly stated in the report. If we postpone action until 2030, the two-degree target will be beyond our grasp unless technologies to remove carbon dioxide from the atmosphere are used. Afforestation and reduced deforestation will help but the alternative of burning biomass and capturing and storing the CO2 would need to be adopted. This is controversial and raises wider sustainability concerns. Prompt action will cut costs and leave open a wider range of options. Cost is a critical question that needs to be addressed in any proposals for action, or inaction. In the report, the IPCC has suggested that action to cut greenhouse gas emissions could reduce global growth by 0.06% per year over the 21st century, leading to a 1.7% reduction in global consumption by 2030 and 3.4% by 2050 relative to a business as usual strategy. Is this affordable? It does not sound much when set against the impact of climate change. And other benefits from improved air quality and reduced dependence on imported fossil fuels are not costed in. However, expenditure would fall heavily on energy bills rather than being spread imperceptibly across the economy. The political leadership challenge is clear. What does it mean for the UK? The Climate Change Act contains a legally binding target for an 80% reduction in greenhouse gas emissions by 2050. This is broadly compatible with the IPCC conclusion that global emissions need to fall by 40-70%. The UK also has a system of five-year carbon budgets that act as stepping stones towards the 2050 target. UK policy therefore has a built-in mechanism which, if used, can ensure that emissions reductions are not delayed. The government is considering a recommendation from the committee on climate change that the fourth carbon budget, covering 2023-27, should not be loosened. The IPCC report provides substantial support for this argument. If the UK is going to play a leading role in international negotiations, cut emissions in line with the IPCC analysis and keep its options open, the prompt action signalled by the existing fourth carbon budget is essential.